August is a good month to look for robber-flies. These animals are active predators that catch other insects on the wing. They act a bit like hawker dragonflies i.e. they sit on leaves watching and waiting and then shoot out and catch their prey when it passes by. 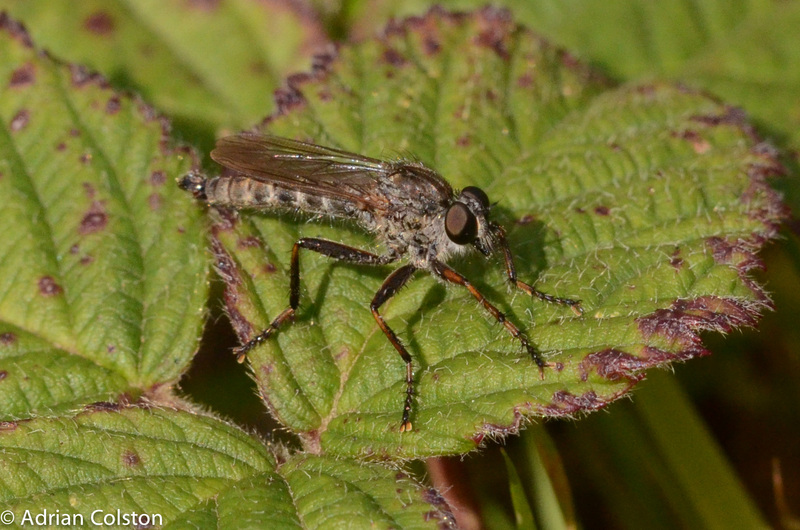 This is the kite-tailed robber-fly Machimus atricapillus. This is one of the medium sized robber-flies – it is identified from other species as it has brown coloration on the femur (the thigh). 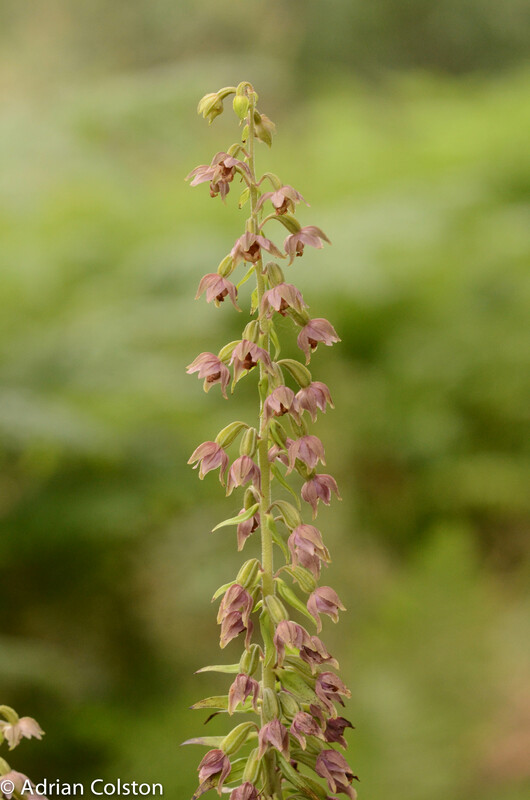 It is quite a common species on heaths and dry grasslands. 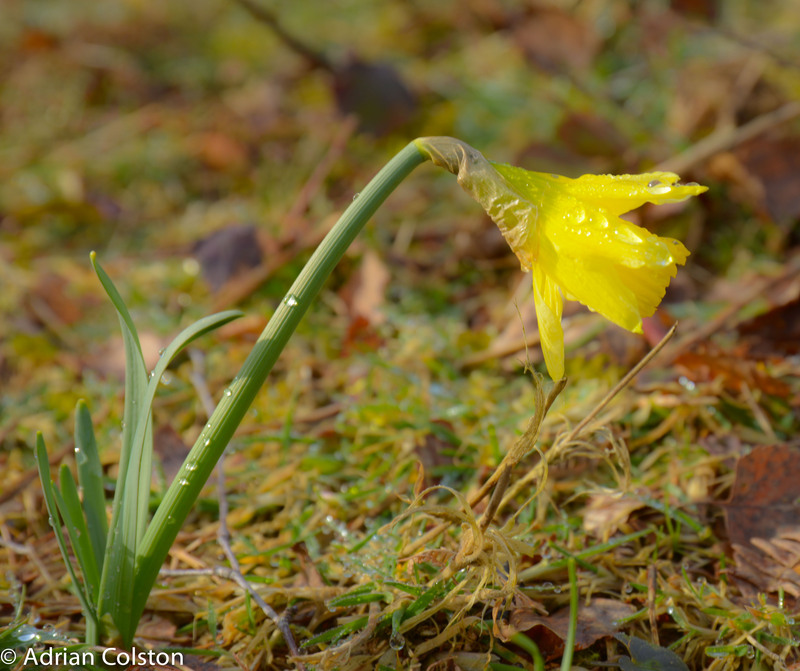 This individual was photographed at Hembury Woods. The speciality robber fly at Hembury is the hornet robber-fly Asilus carbroniformis – a huge species with a yellow tail – unfortunately no sign of that species on my last visit….. – will have to go again! 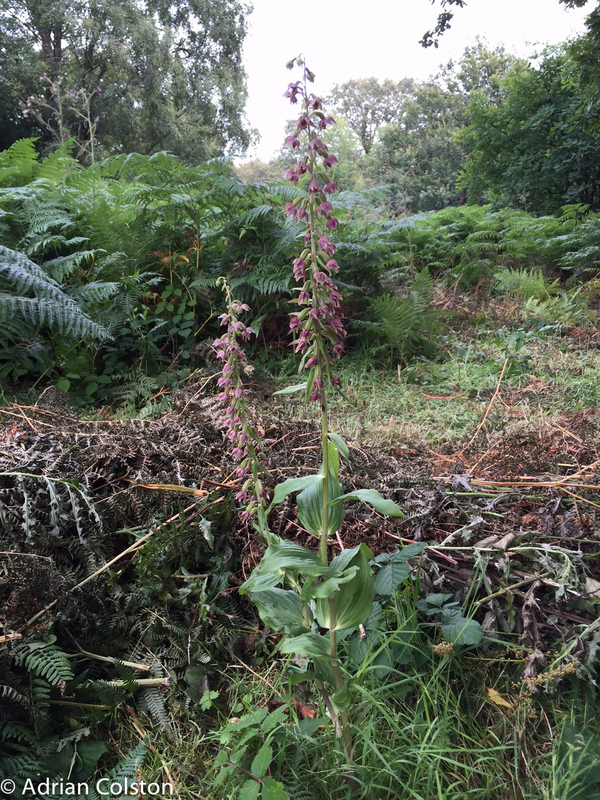 I was at Hembury Woods yesterday and saw this orchid by the path. 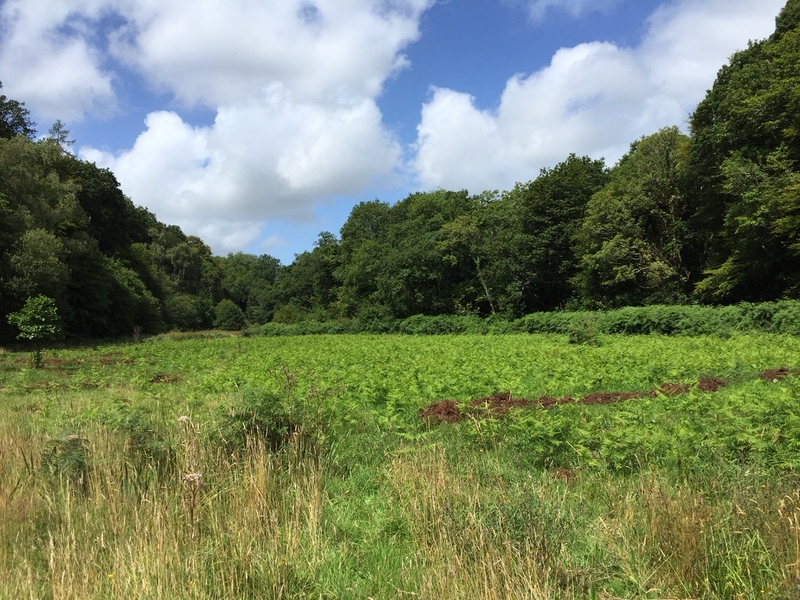 Our Ranger John Wales has corralled it with a ring of cut bracken to stop it being inadvertently trampled by visitors. 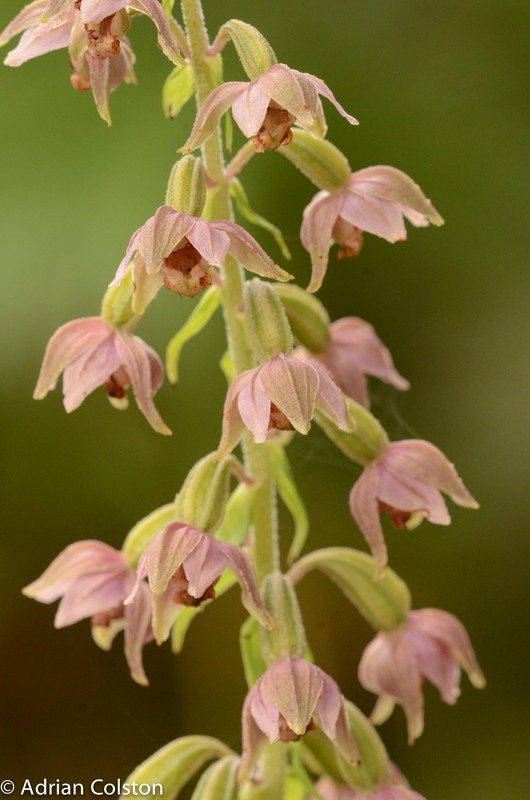 Very few orchids are common and broad-leaved helleborine certainly isn’t. It is a widely distributed species but is usually hard to find and it is rarely abundant. Deer often eat them before they get to this stage. I went to have a look at Burchett’s Meadow earlier in the week as I haven’t been there for 8 years! 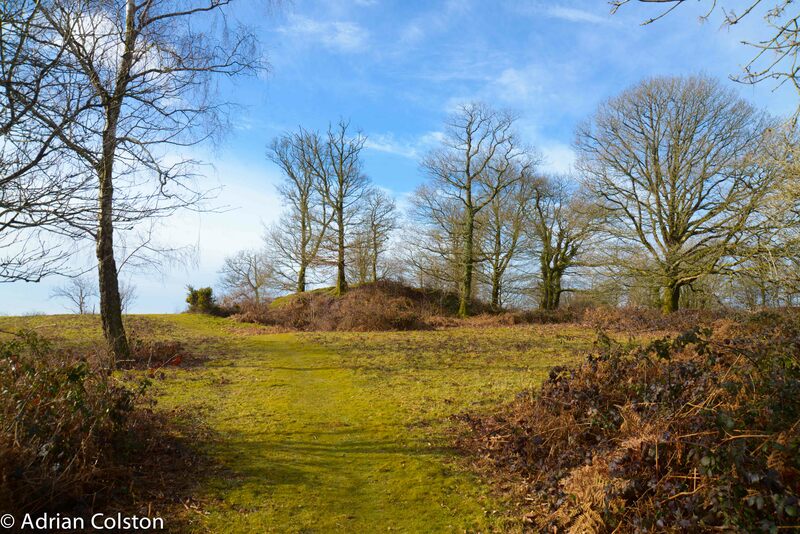 It is a small meadow owned by the National Trust in between our two woodlands – Birchett’s and Hembury Woods. It is a small meadow with a small stream running beside it and it is rich in wildlife – a good place to see silver washed fritillaries. 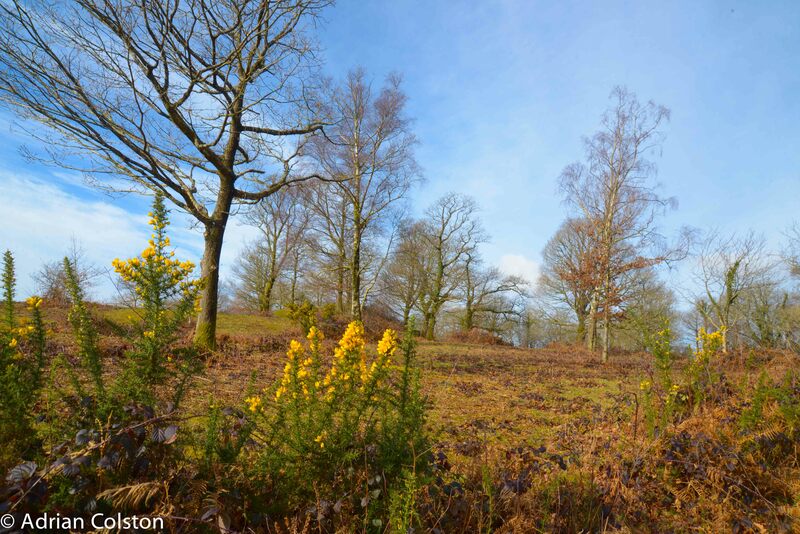 Our Ranger John Wales has done a good job managing the bracken. 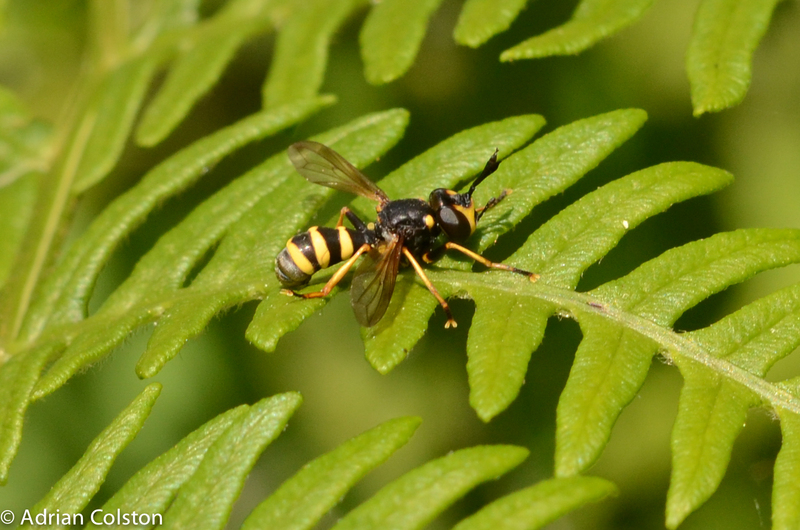 I found this small wasp-like fly with very long antennae – initially I thought it was a hoverfly in the genus Chrysotoxum but it didn’t quite fit. After a bit of googling and leafing through field guides I realised it was a fly called Conops flavipes which is closed related to the hoverflies. As well as supporting 5 species of fritillary (the three from yesterday’s blog along with pearl and small pearl bordered), Hembury is also home to a huge range of other wildlife. Here are a few pictures of some of the species currently out and about. 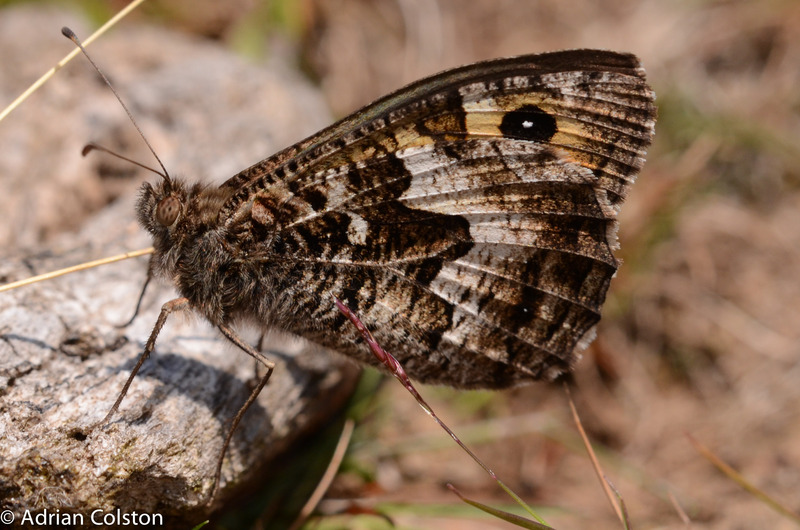 This is the grayling butterfly – it is a cryptically coloured animal which is easiest to spot if it is disturbed. 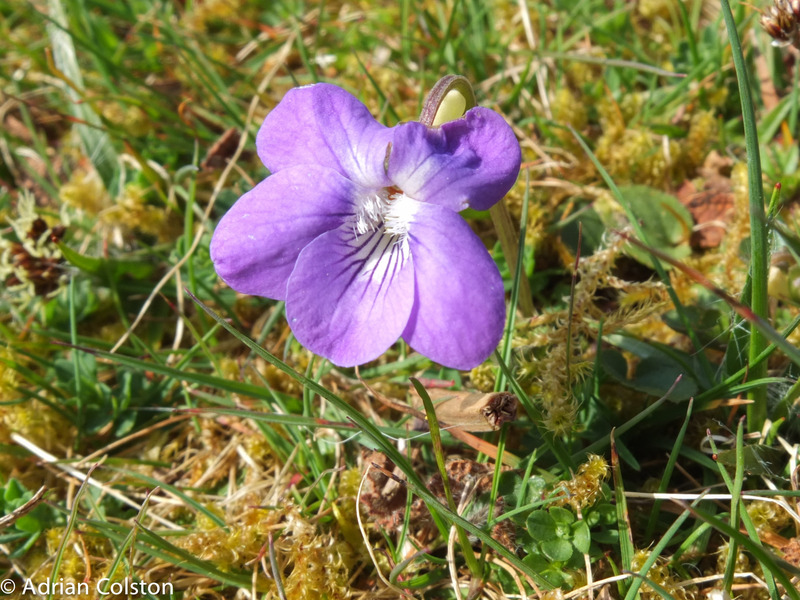 It is uncommon on Dartmoor – Hembury and the heathland around Castle Drogo are good places to see it. 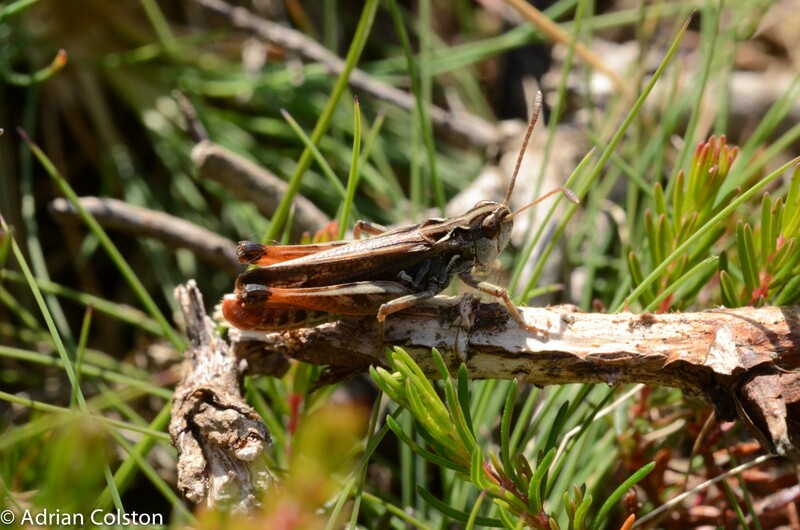 This is the mottled grasshopper which again is uncommon on Dartmoor but at Hembury it occurs in very large numbers. 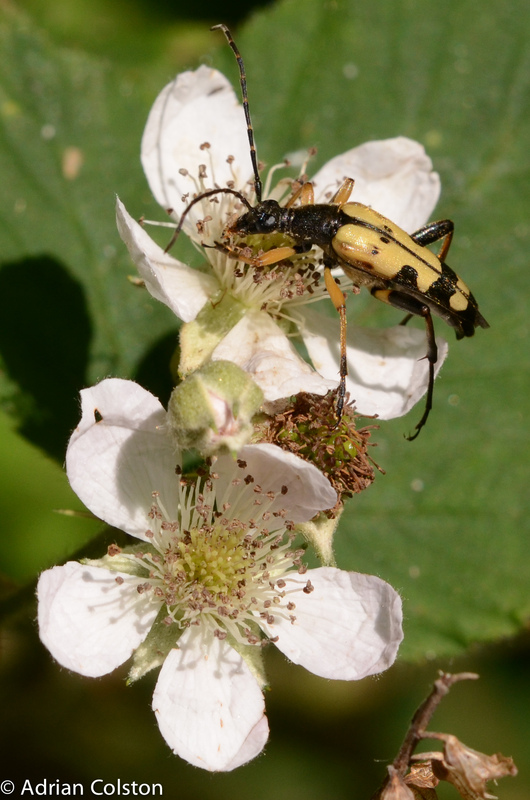 It is identified by the presence of swollen tips to the antennae which can be clearly seen in this picture. 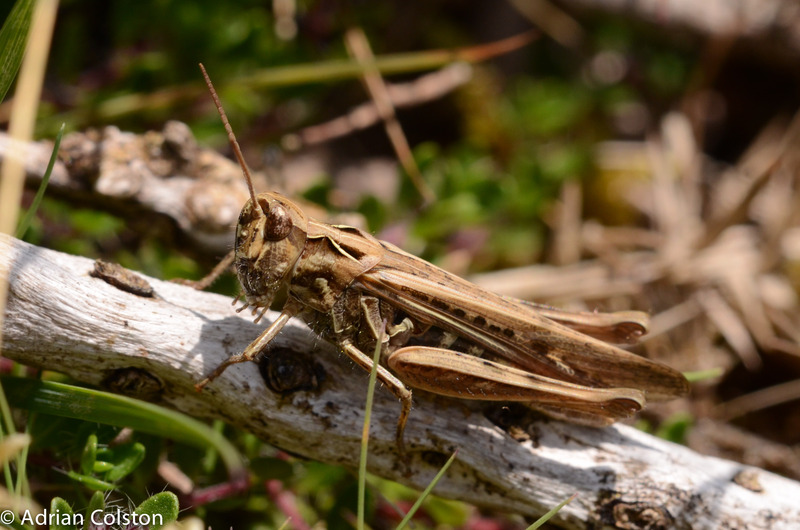 This is a field grasshopper – very common in Devon – looks superficially like the mottled grasshopper but no swollen tips to the antennae. 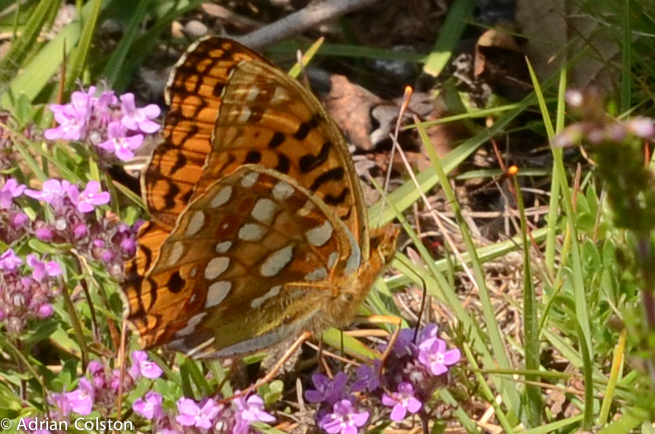 Finally a high brown fritillary! 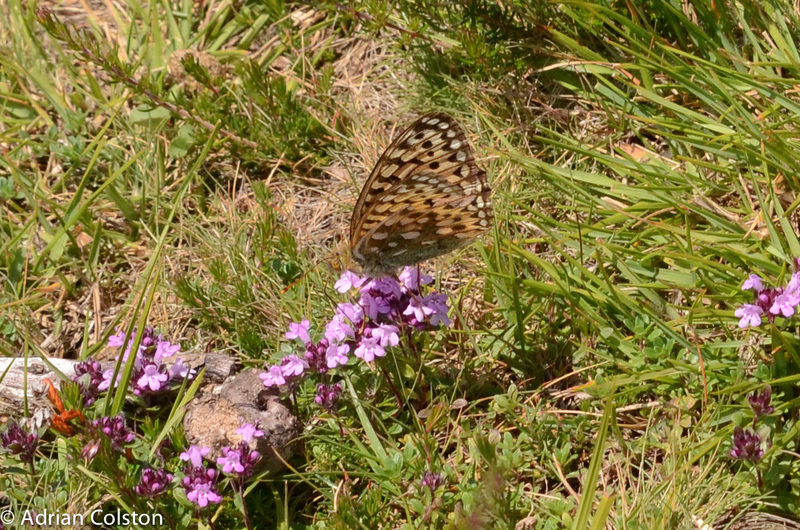 The high brown fritillary is probably the most endangered species of wildlife on Dartmoor – indeed the UK. It has undergone massive declines over the past decades and now only hangs on in a few locations – Dartmoor and Exmoor are its strongholds. 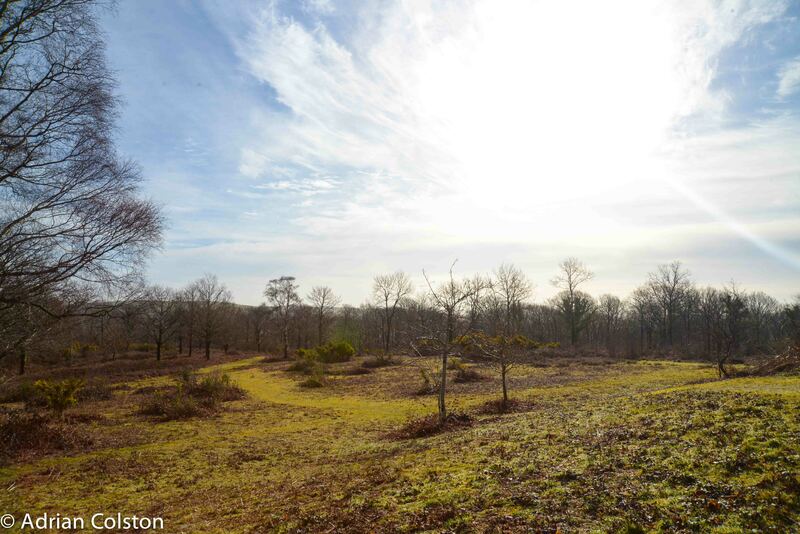 Hembury Woods and its environs are where the species is now doing its best. Hard work from our warden John Wales and cutting edge research from Professor Jeremy Thomas and Dave Simcox have ensured that the Hembury population is vibrant, strong and is bucking the national trend of decline. 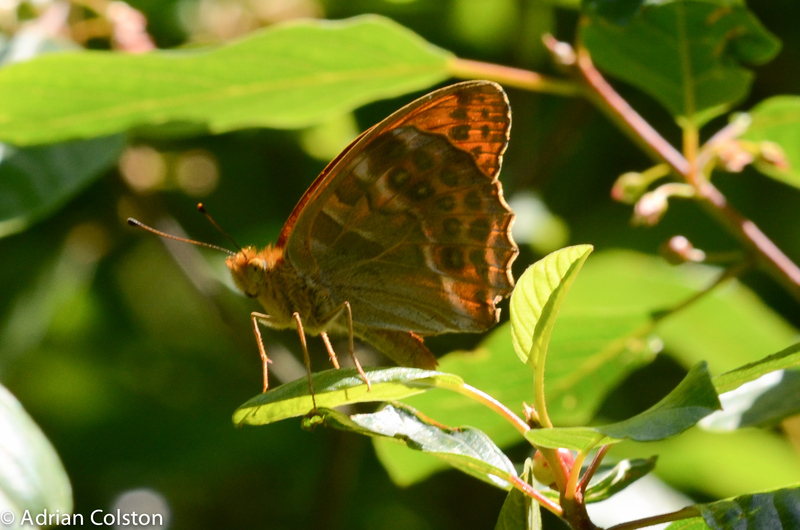 High brown fritillaries are very, very difficult to identify – they are extremely similar in appearance and behaviour to dark green fritillaries – in additional they fly extraordinarily fast and only stop very infrequently. 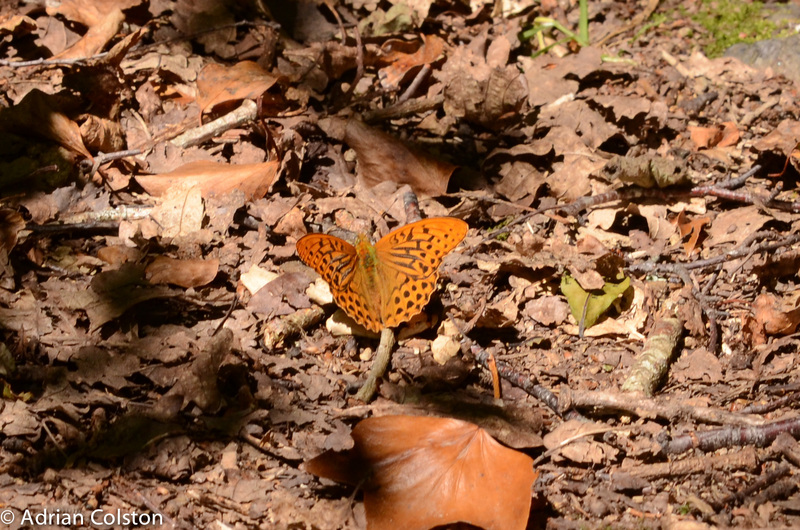 They can also be mistaken for silver washed fritillaries – another large grit species also on the wing in July. Over the past three weeks I have spent hours and hours trying to see a high brown fritillary – they have dominated many of my weekends and evenings! Until today all this effort had been without success. Finally today – just as I was beginning to truly despair – I managed to see and photograph a high brown frit. During my previous visits I have seen dozens and dozens of fritillaries many of which were no doubt high browns but they just shot past and never settled. Those that did settle were invariably dark greens. That is until today! Finally I managed to photograph one. Be prepared – the following photos are what we – in the trade- call ‘record’ photos – they are not publication quality images but they do show the salient ID features. There are three rows of obvious white blobs – in between the two to the left of the hind wing are a string of red circles (three of which have white/silver dots) – this is the feature which characterises the high brown fritillary. A very enlarged close up – thus the quality – of the fore wing (the wing on the right) – there are two black blobs at the top with a much smaller dot underneath which is indented – i.e. not in line with the blobs – another characteristic feature of high browns. 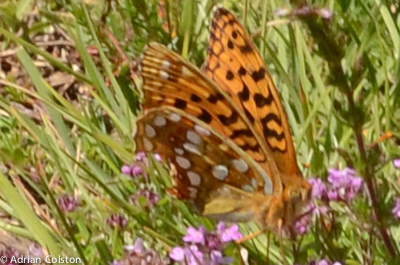 I also saw a number of dark green fritillaries – here is a female – blobs not indented and no red circles with silver dots – see my earlier blog on dark greens for better photos and explanations – see here. To cap the day – silver washed fritillaries are now also on the wing – they emerge in early to mid July. Here is the underwing of a silver washed fritillary – note the long silver line on the under wing – diagnostic. And here is a male silver washed – the ‘brand’ marks on the upper forewings are the tell tail sign to identification. Well what a day! 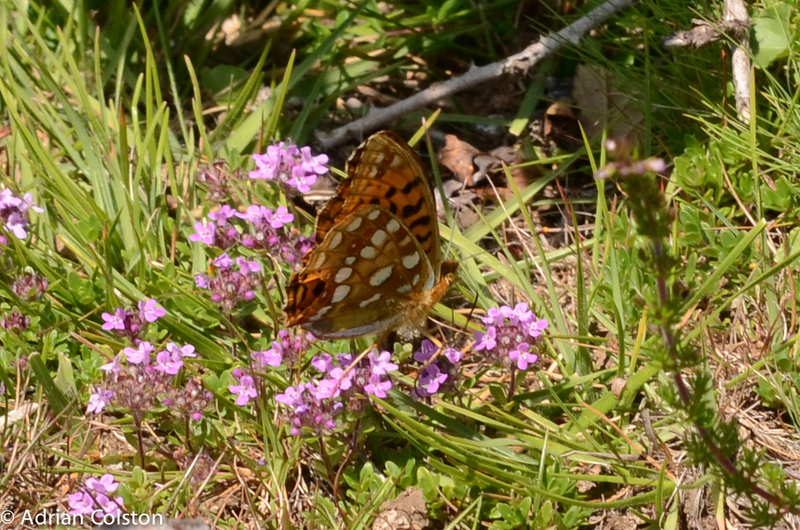 I finally managed to see and identify a high brown fritillary and also see the other two species of large frits. Then to cap it all I managed to get a few half decent photos of all three species. 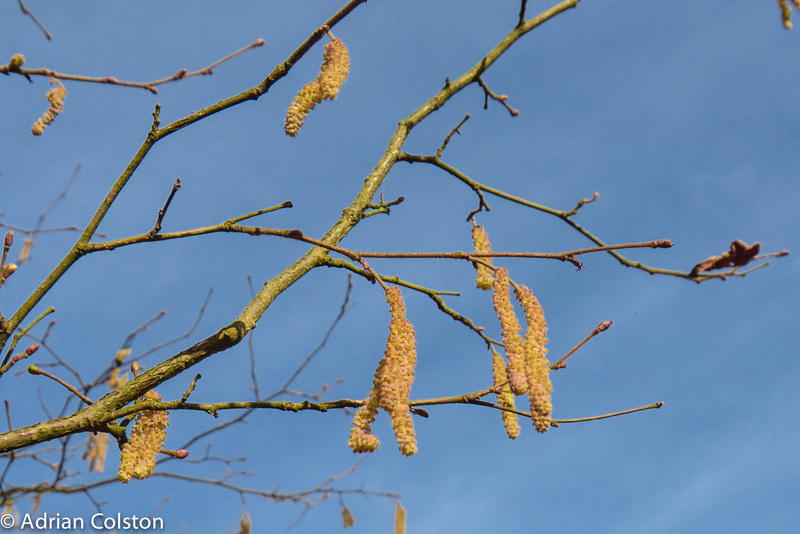 With natural history and wildlife – patience and persistence is everything – that’s my top tip ….. for life! 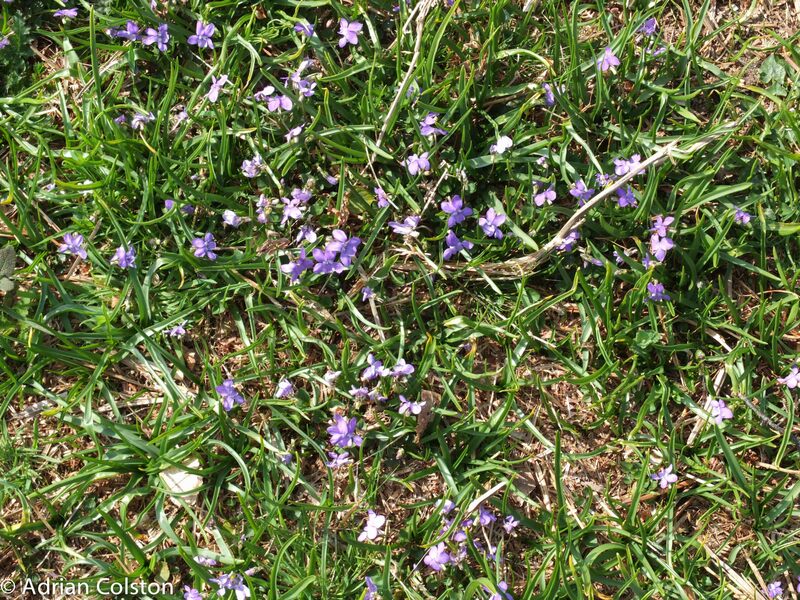 From a distance it looks as if the bluebells are out – they are not – it is still too early. 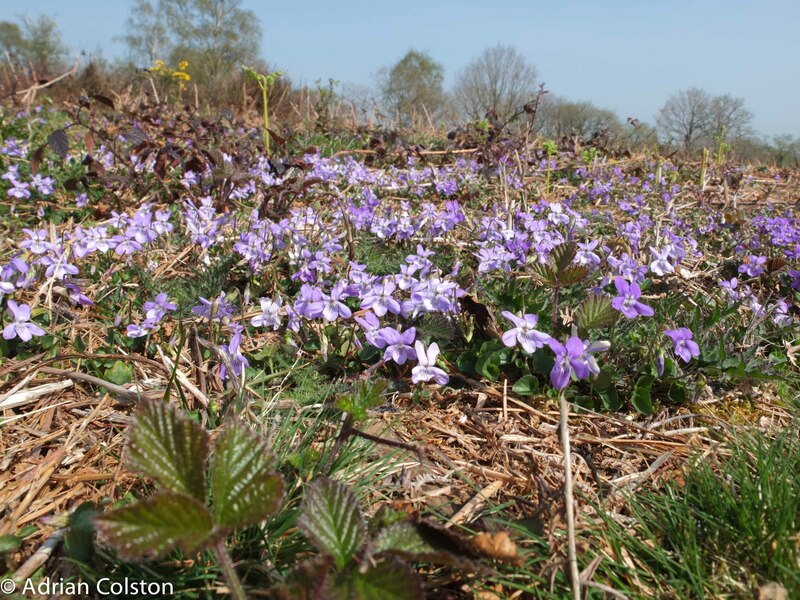 When you get closer you see they are violets – thousands and thousands of them. 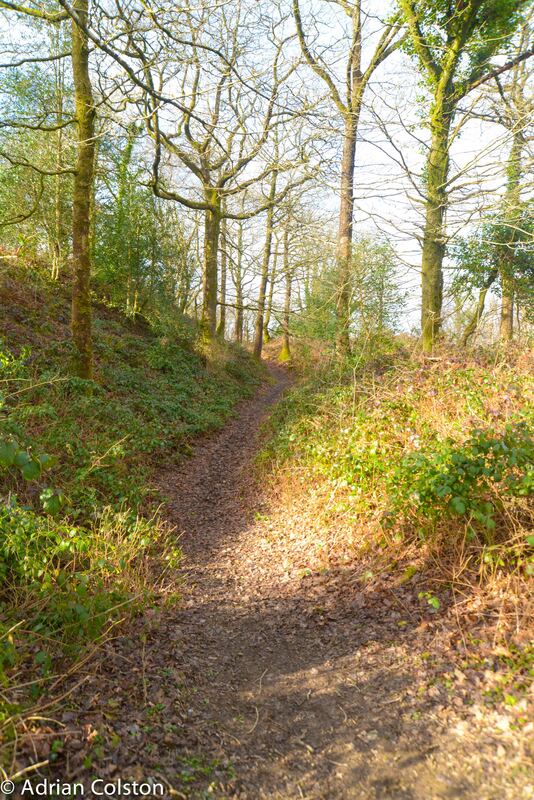 I was at Hembury Woods on the River Dart yesterday morning. Took a few photos …….